Apolsoft Android SMS Transfer for Mac is an application designed for cellphones running Android 2.1/2.2/2.3. It allows you to transfer and backup your SMS messages between android phone and Mac. Backup SMS into Data file(.db); Restore SMS to your android phone; You could view/edit/delete/print your android SMS on Mac. In a word, you can backup and resotre your SMS between android phone with your Mac and manage the SMS on your Mac easily. 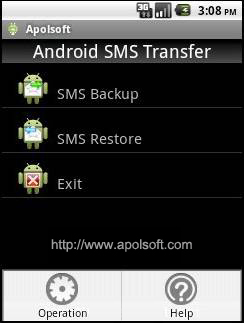 Apolsoft Android SMS Transfer for Mac is the only smart andriod SMS backup and managment software. I think all android users should own such a powerful android SMS backup manager, because it is a rare good software. Also, you can free download this SMS Messages Transfer solution for android phone! *Backup and save all your android phone SMS to Mac. *View and edit exported text message on Mac. *Restore SMS from Mac to android phone. *Desktop tool support:Mac OS X v10.4 - 10.7. *Phone port support: Android 2.1/Android 2.2/Android 2.3. *Transfer SMS into .db file and print it on Mac. *PC manage tool support txt,excel,csv export. Qweas is providing links to Apolsoft Android SMS Transfer for Mac 3.1 as a courtesy, and makes no representations regarding Apolsoft Android SMS Transfer for Mac or any other applications or any information related thereto. Any questions, complaints or claims regarding this application Apolsoft Android SMS Transfer for Mac 3.1 must be directed to the appropriate software vendor. You may click the publisher link of Apolsoft Android SMS Transfer for Mac on the top of this page to get more details about the vendor.